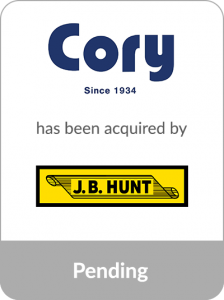 J.B. Hunt Transport Services, Inc. (NASDAQ: JBHT), one of the largest supply chain solutions providers in North America, has announced its subsidiary, J.B. Hunt Transport, Inc., has entered into a definitive agreement to purchase Cory 1st Choice Home Delivery (“Cory”) for $100 million. Cascadia Capital acted as the exclusive financial advisor to Cory in the transaction. Bloomberg News and the Wall Street Journal covered this transaction in greater detail in recent articles titled As Millennials Buy Everything Online, Truckers Reap New Riches and J.B. Hunt Builds Up the Last Mile. Based in New Jersey and founded in 1934, Cory is a family-owned business that provides home delivery services of big and bulky products in the continental United States and U.S. territories through warehouses and other customer-owned facilities. Cory utilizes more than 1,000 independent contractors, carriers and delivery drivers to complete over 2 million annual deliveries. The acquisition represents another successful transaction for Cascadia in the Transportation & Logistics sector, and another bellwether transaction in the final mile logistics space. Cascadia most recently advised Watkins & Shepard in its acquisition by Schneider National, Haney Transportation & Logistics in its acquisition by Wilson Logistics, TransGroup Global Logistics in its partnership with AEA Investors, and Global Transportation Services in its sale to American Fast Freight.